Close your eyes and envision your dream kitchen. Perhaps you picture a bigger, brighter room with lots of windows, cabinets and counter space. Maybe there is an island where your family and friends can hangout while you prepare dinner. How about a custom pantry, a mini office space, or a wet bar for entertaining? No matter what is on your list list, we can help you envision, design and create your dream kitchen that strikes a balance between form and function, with timeless architectural details you’ll treasure for years to come. It's time to bring your dream kitchen to life. inVision Contracting is a design/build firm specializing in high quality, residential kitchens, renovations, and additions. For over 35 years we’ve been crafting architecturally refined homes for our clients and their families. Our team of skilled and trusted professionals includes architects, craftsmen, designers, and decorators. We also offer construction-only services for those who already have their architectural plans in place. We provide superior craftsmanship and quality service, regardless of the scope of your project. At inVision Contracting we demand the highest level of quality, craftsmanship, and design to assure your project will exceed industry standards and provide you with years of enjoyment. In order to provide this quality service, inVision Contracting utilizes its wealth of experience in all aspects of the building process from pre-construction services through final closeout and review. Respect for you and your home is extremely important to us. Through our careful planning and preparation, we make every effort to reduce the impact of the remodeling process on your home and your life. We go above and beyond industry-leading measures to contain construction dust and we try to minimize the duration of construction that might limit access to important rooms, such as kitchens. We take care of the details to ensure that nothing is overlooked. Your project isn't finished until every item is completed and you’re 100% satisfied with our work. for everyone involved in your “dream space” project. Our relationship begins with a free discovery meeting at your home to assess your needs, wants and expectations for the project you are contemplating. This meeting provides you the opportunity to meet with us face-to-face and to ask any questions or raise concerns you may have, in order to give you the assurance that we’re the right fit for you and your project. Should you choose to engage with inVision Contracting after this meeting, we will begin to help you realize your dream space with a Project Design Consultation. This on-site meeting brings together Jim Dubois, Owner of inVision Contracting, and if needed, his architectural design consultant to review your portfolio of ideas and explore a range of design possibilities. This consultation includes a critique of your ideas, possible on-site sketching of design solutions, as well as a discussion of budget, time line and our design/build process. This consultation is billed on an hourly basis. Our Design Process includes additional conversation with you regarding project requirements, project development and assessment of existing conditions. We will prepare floor plans and building elevations sufficient to convey the basic design intent, while refining the anticipated project budget. Our goal during this phase is to create a conceptual design that includes broad ideas of functionality, aesthetics and investment. All of these elements are roughly shaped at this point. This is where we will discover and define your priorities between creativity, practicality and financial feasibility. This preliminary design work is also billed on an hourly basis. In this phase we will draw a detailed set of plans, usually for a fixed fee, that are necessary for project estimating and obtaining building permits. These plans are then presented to you for review. When the design is accepted, we will work up a final quote to build your project. After approval we will provide you with a contract, complete with a time line and payment schedule. Once the contract is signed by both you and inVision, your “dream space” project can be created. This is where the transformation of your “dream space” begins. We develop a close working relationship with everyone involved in your project, especially you, our client. You take on an integral part in the creation of your dream space. Your role is to finalize your product selections so that we can integrate the order and delivery of these products into our schedule. We understand how overwhelming this selection process can be, so we will work with you to help prioritize this list. "We recently worked with Jim for our first floor renovation including creating our dream kitchen. From the design phase to planning and execution the entire process was seamless. Jim was really easy to work with and incredibly professional. The entire renovation took 6 weeks while other contractors estimated twice that time. We couldn't be happier with the finished product and wouldn't consider anyone else for future home renovations. We highly recommend inVision Contracting, Inc!" "We have used inVision Contracting for several projects and have never been disappointed. When it came time to renovate our kitchen, we knew that Jim would do an outstanding job. From the initial planning stage to the completion of the project, inVision Contracting helped us create and achieve the kitchen we had always wanted. Jim was especially understanding of our need to remain in our house during the remodel. He and his sub-contractors made it as painless as possible to conduct our lives without a kitchen, and were respectful of our living space and daily routines. Jim was extremely professional and possessed a great attention to detail, which was clearly evident when we first saw our new kitchen. It's become our favorite room in the house. We knew that we could count on Jim to check in and make sure that our new space was functional and up to our standards. Thanks to inVision Contracting, we plan to enjoy our kitchen for years to come." 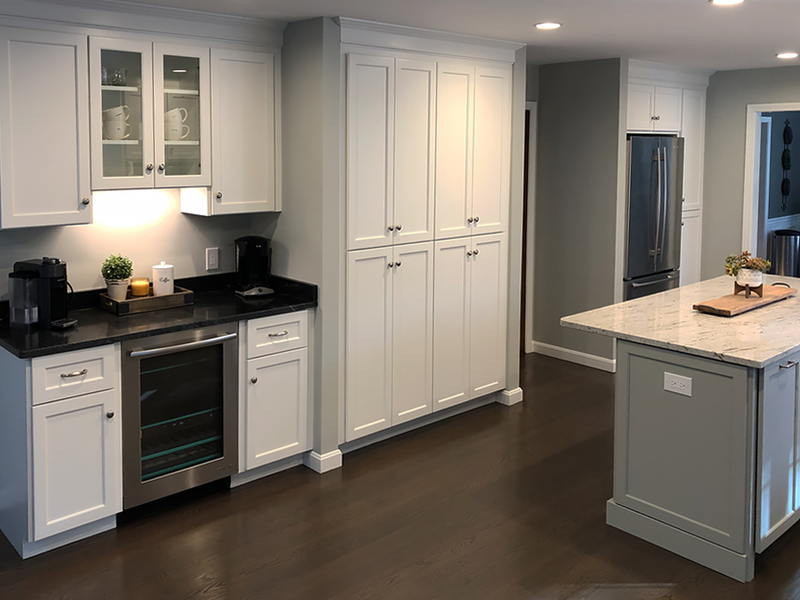 “From the initial consultation to the final stroke of paint, Jim Dubois demonstrated the utmost patience and professionalism during our kitchen/family room remodeling project. He has an unmatched work ethic, is creative, and gives amazing attention to every detail. It was a challenging project for us with walls coming down, plumbing pipes and electrical wires being moved, and all the decisions, decisions, decisions, but Jim guided us through with ease. Each member of his team was skilled, courteous, and respected our privacy as well. Based on the sterling reputation of inVision Contracting, we were confident that our renovated space would be showroom quality and we weren’t disappointed. The most lived in part of our home has been totally transformed!" “Our experience with inVision Contracting was fantastic from beginning to end, and we would absolutely not hesitate to engage them again on future projects. We were continually impressed with the creativity and inspiration shown during the design process, the coordination and high quality craftsmanship during the demolition and build-out phases, and the communication, cooperation, and respect shown by Jim and his team throughout the project. Our kitchen renovation was easily the most ambitious upgrade that we've undertaken and we couldn't be more pleased with the final product." “When my wife and I decided to redo our kitchen, we wanted to do it just like we had seen on TV – talk to 3 designers, select a plan and hire a contractor. But everyone we spoke with was more interested in selling us products than listening to our needs and concerns. When we met Jim Dubois, he listened! The three of us designed and redesigned until our concerns, needs, and budget limitation all came together. The timelines and schedules were met throughout the entire construction process. When we decided to do more remodeling we didn’t even contact other contractors, we just hired Jim. We appreciate Jim’s professionalism, integrity, and personal touches. His care and attention to detail were second to none and the design was amazing considering our budget." “We would not use anyone else! Jim and his entire team are top notch and truly professionals in their fields. Our kitchen remodel (including knocking down the dining room wall, all window and door replacements) went so smoothly, and on time. We absolutely LOVE our new space. Jim was on-site working alongside his project team every day. They cleaned up each day, which was awesome. The suppliers he uses are so easy to work with and they had everything we needed to make our remodel something to be proud of. Great experience!" How did you hear about inVision Contracting? Thank you for taking the time to visit our website and for sending us your contact request. We're looking forward to speaking with you and welcome the opportunity to discuss your project. We'll be in touch with you shortly. Owner of inVision Contracting, Inc.